A great side dish or a meal in itself. Use this recipe as a jumping off point to many exciting flavors. Dice up some root vegetables, mushrooms or chicken and place them in the bag with the rest of the ingredients. Top with sautéed mushrooms and some grated cheese and you have an easy to reheat (and repeat!) hit that can be made up to 4 days ahead of time. Set the Sous Vide Professional™ to 185°F/85°C, with the Rear Flow Adjustment Slide closed and Front Flow Adjustment Slide fully open. (Flow Adjustment Slide available on CHEF Series only.) Cover bath to maximize efficiency at this high temperature. Vacuum seal the polenta, 1½ C of stock (Reserve ½ C for mushrooms in Step 6), half and half, and butter in a large sous vide bag. Cook polenta 1½ to 2 hours, until liquids have fully absorbed. In a sauté pan over high heat, caramelize mushrooms. Avoid stirring during the first 30 seconds. When mushrooms have browned evenly, add shallot and garlic. Sweat, but take care not to brown shallot and garlic. Deglaze the pan by adding white wine. Reduce by wine by half. Add ½ C stock. Again, reduce by half. Season mushrooms and add fresh tarragon. Remove from heat. Remove the bag of polenta from the water bath. Open the bag and pour the polenta into a serving bowl. Gently stir in half of the cheese and reserve the rest for garnish. Season with salt and pepper. 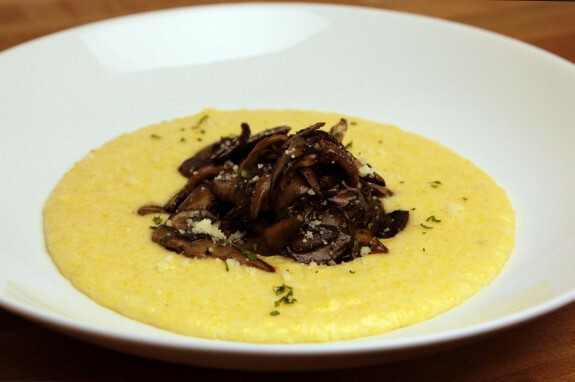 Garnish polenta with sautéed mushrooms and parmesan cheese.